Your feet are the foundation for every step of your workout, they deserve just as much care and attention as any other part of your body - but you don't need an expensive spa treatment to take care of them. Squirrel's Nut Butter is the superior solution to restoring your dry, cracked, and callous feet. Our 4.0 oz Tub of Happie Toes All Natural Foot Salve rejuvenates damaged feet by locking in moisture and feeding your skin with all natural ingredients that organically restore hydration and provide soothing pain relief. This blend is a special twist on our classic mix - hand poured and made with coconut oil, kokum butter, beeswax, vitamin E oil, peppermint oil and tea tree oil. Without using harmful chemicals, paraffins, or parabens found in most foot salves, Squirrel's Nut Butter is the preferred choice to match your all natural lifestyle. Simply massage into feet to moisturize and restore dry, cracked skin. Whether you're cycling trails, climbing cliffs, hiking canyons, or running along coasts, get ahead of the game and avoid the preventable hang ups before they have the chance to develop into something debilitating. SNB's natural solution can be purposed beyond intensive activity. This salve is the simple and effective solution for diaper rash, tattoo recovery, razor burn, or people who generally enjoy softer skin. Heal quicker with the hydrating and restorative effects of our Happie Toes Foot Salve. Calling all runners, marathoners, mountain bikers, cyclists, hikers, motorcyclists, triathletes: don't let skin irritation hold you back from being the best version of you. 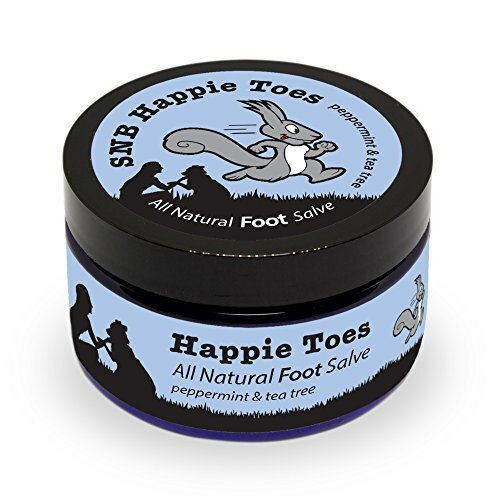 Be free from your pain and get the most out of your adventures with our 4.0 oz Tub of Squirrel's Nut Butter Happie Toes All Natural Foot Salve. If you have any questions about this product by Squirrel's Nut Butter, contact us by completing and submitting the form below. If you are looking for a specif part number, please include it with your message.